A decades old unsolved murder case could be making a leap towards identifying 5 of the remaining unidentified victims that were found dead in Fort Myers. The remains of 8 people were found along Arcadia Street in 2007, and twelve years later, only 3 of the victims have been identified by officials. Fort Myers 5 facial reconstructions by S. Steinberg. 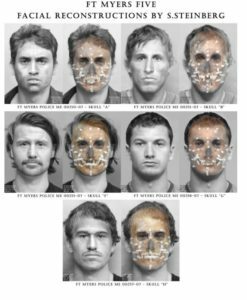 In hopes of revealing the names of the victims, the Lee County Medical Examiner recently requested new facial reconstructions from a forensic artist with the Miami Dade Police Department. Fort Myers Police plan to release the new images on Monday with hopes someone will recognize them.